Sift the unsweetened cocoa into a bowl and whisk in the boiling water until you have a smooth, dark, paste. Whisk in the vanilla extract, then set aside to cool a little. In another bowl, combine the almond meal and flour with the baking soda and salt. In the bowl of a freestanding mixer with the paddle attachment, combine the sugar, olive oil and eggs and beat together for about 3 minutes until you have a light, fluffy cream. Turn the speed on the mixer down and pour in the cocoa and vanilla paste, beating as you go. Slowly add the flour mixture until it is evenly combined. This may require scraping down the side of the mixture to incorporate the flours fully. Pour the liquid batter into the prepared tin and sprinkle with flaky salt. Bake for 40-45 minutes or until the sides are set and the top of the cake still looks slightly moist. A cake tester should come up clean with a few crumbs on it. Allow the cake to cool for 10 minutes on a wire rack, still in its tin, and then run a knife around the sides of the cake. Release the spring on the pan and transfer the cake to a serving dish or cake stand. Sprinkle with more flaky salt. 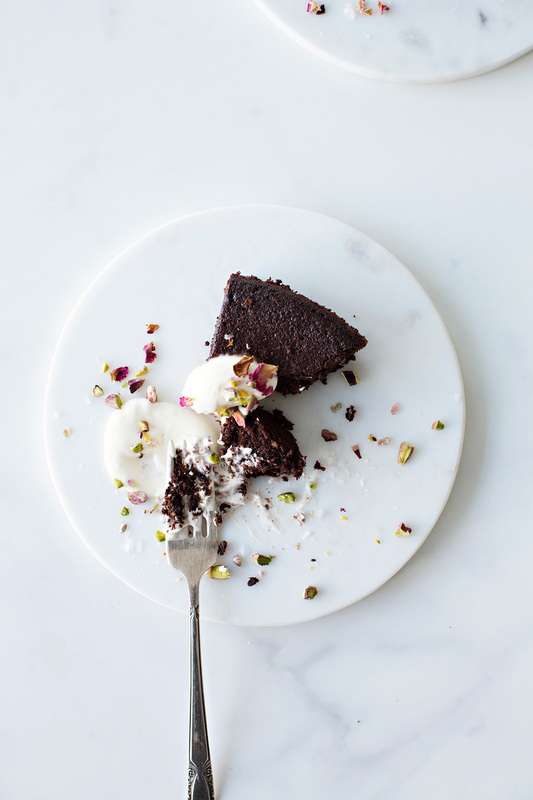 Serve it with creme fraiche, dried rose petals and pistachio.